This is AG8888 a Call Waiting decoder used on the telephone. Call Waiting service works by alerting a customer engaged in a telephone call to a new incoming call. Thus, the customer CAN still receive important calls while engaged in a current call. The Call Waiting decoder CAN detect dual-tone (2130Hz and 2750Hz) alert Tone and generate a valid Timing on the data pins for micro controller. 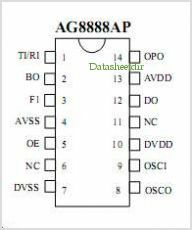 This is one package pinout of AG8888,If you need more pinouts please download AG8888's pdf datasheet. AG8888 circuits will be updated soon..., now you can download the pdf datasheet to check the circuits!